Posted June 12, 2016 by admin & filed under Dental Implants, Diseases and Treatments, Teeth Care. If you have dental implants, cleaning and disease prevention are just as important as they are for natural teeth. Peri-implant diseases are inflammatory conditions in the soft and hard gum tissues that surround dental implants. Just like it does around natural teeth, bacteria can build up on the base of the implant, just below the gum line. This can then cause the gum tissue to become irritated, inflamed and damaged, if it isn’t caught in time, it can lead to bone loss. There are two classifications of peri-implant diseases: Peri-implant mucositis and peri-implantitis. 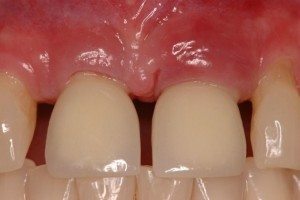 Peri-implant mucositis is gum inflammation found only around the soft tissues of the dental implant, but does not include any signs of bone loss. If caught early, it can be treated successfully and the effects can be reversible. Peri-implantitis occurs when the soft tissue of the gums gets inflamed to the point that there is deterioration in the bone that supports the dental implant. Treatment generally requires surgery to repair. Symptoms of peri-implant disease are similar to other gum disease and include redness and tenderness around the implant and bleeding when brushing. The risk factors of peri-implant disease include a previous diagnosis of periodontal disease, poor or lack of plaque control, smoking and diabetes. Preventing peri-implant disease is similar to other disease prevention for natural teeth and gums, including proper teeth brushing and flossing. Of course, regular check-ups and professional teeth and dental implant cleanings are very important. Are you due for your next check-up? Call Modern Family Dental Care today! Remember, if you care for your dental implants you’ll have a lifetime of beautiful smiles.